It’s simultaneously an exciting and terrifying time to be alive. The driverless car revolution is upon us, and on Wednesday, Waymo announced that it has launched the world’s first commercial autonomous taxi service. Unfortunately, only a select group of people will be able to take it for a spin. It’s been a little over eight years since Google first began testing self-driving cars on the road, but it still seems to be moving at an incredible speed of development compared to its rivals like Uber. The fact is, Google’s spin-off company, Waymo, is actually being pretty cautious and taking baby steps. It’s been training its fleet in a limited area around Phoenix with a select group of test-riders. Waymo’s CEO, John Krafcik, said Wednesday that same group of riders will be the first customers for the commercial launch of Waymo One. In a blog post, Krafcik explained that “hundreds” of people who participated in the early rider program will be given access to the Waymo One app and pretty much continue doing what they were doing before—testing the service and providing feedback. The big difference is that select group will now be paying for the honour. Another portion of the group will continue in the early rider program trying out new features as Waymo adds them. The service will operate 24/7 and be limited to select areas in the US state of Arizona. Although Google built up a lot of hype over its milestone achievement of running test rides with no safety driver last year, there will be someone behind the wheel of the commercial service for the time being. Taking things slow is good; Waymo has had a few traffic incidents, and Uber has had one fatal accident involving a self-driving vehicle. 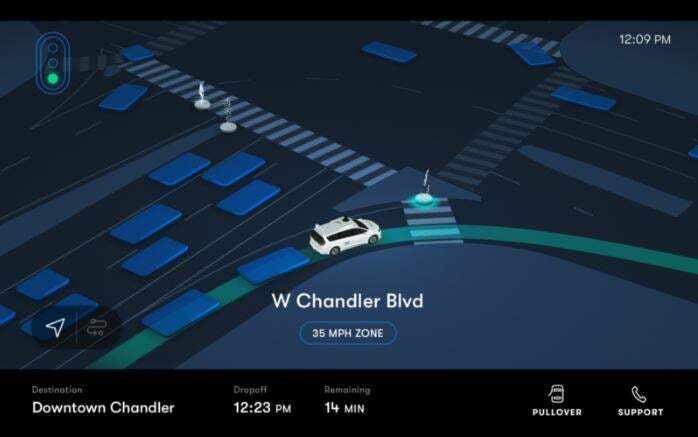 The Waymo One app doesn’t appear to be much different than Uber’s, though the route-tracking screen shows off some more details surrounding the car. The Verge took a test drive with the commercial service and said “the app is a little buggy” and the ride was “uneventful.” Waymo rejected The Verge’s request to ride in a car with no safety driver. From the perspective of pure innovation, one has to admire what Google is accomplishing here. From the perspective of societal change, people will won’t have to spend time focused on being stuck in traffic, we’ll hopefully see fewer deaths behind the wheel, and artificial intelligence will experience significant benefits. But this change also aims to put a lot of people out of work. The US Bureau of Labor Statistics recorded a little over 1.8 million lorry drivers in the US in 2016, and almost 200,000 taxi drivers and chauffeurs in 2017. Few of them can be excited about autonomous vehicle advancements. In typical corporate fashion, Waymo is spinning the future in the lamest way possible. Krafcik said that early riders had “inspiring” stories to tell. He writes that they “used our self-driving vehicles to take courses at a local college, commute to work and to high school, accompany a vision-impaired aunt shopping, get to book club each week, connect to buses, and try new restaurants on date night.” In other words, the test group went about their lives and took a Waymo rather than a taxi. We’re still a long way from the real consequences and benefits of this kind of service. The predictable landscape, weather, and traffic patterns of the current testing areas in Arizona make it attractive for testing autonomous vehicles. Waymo’s pilot program in the US city of Detroit, in the northern part of the country, is a much more demanding crucible.